Chekpeds board is pleased to welcome Allen Oster, of Chelsea on the board. Alan is President of the W400 Block Association ( 20/21st Streets) and the co chair of the Quality of Life committee of Manhattan Community Board 4 . He is also active on the Midtown South Quality of Life committee. He is a terrific addition to the board. We are also delighted to welcome back Ernest Modarelli, who had left for a stint at the Governor’s office. Ernest moved back to 45th Street in Hell’s Kitchen. This year saw the passing of Alison Tupper, one of the original members of CHEKPEDS. Alison was an example of advocacy done right, with a passion for protecting the Hudson river. She extended her energetic efforts into fighting the stadium, saving the 45th Street playground’s mural as well as keeping the 46th block association alive and well. She was an inspiration to all of us. R.I.P. Alison. Long term member Eric Muise, is moving to Boston. He leaves behind powerful memories and accomplishments. We wish him the best of luck. Kathleen Treat has graciously taken over the functions of Secretary. Howard Carlin, of Chelsea ( 23rd street) stepped down from the board to pursue other interests including moving to Florida for part of the year. Warm wishes to Howard. After four year of fruitless legal wrangling between agencies DOT and Parks decided in 2013, to build the southern half of the Plaza, by taking over a full lane of parking. HYHK bid started to manage the plaza in 2015. They added table, chairs and umbrellas as we ll as a beautiful sculpture by a local artist. They also stationed security personnel. Finally in 2018, the developer Quadrum was interested in greening the neighborhood and in partnership with the Port Authority and the HYHK BID , completed the north side of the plaza. We are thrilled with the outcome and extremely grateful to all the individuals and organizations who helped us along the way. 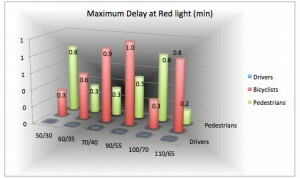 Following the September 2018 publication of the New York City Department of Transportation (DOT)‘s study “Cycling at a Crossroad”, a cyclist and a pedestrian joined forces in developing a simulator to identify the best possible signal timing, one that would provide the maximum safety to both pedestrians and cyclists while guaranteeing the longest green wave for cyclists, pedestrians and vehicles. 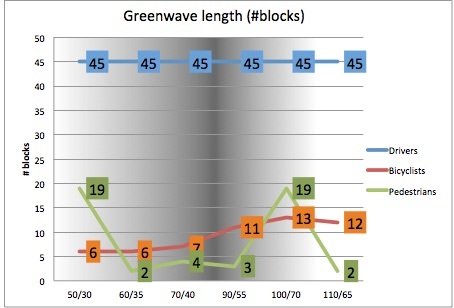 Based on 6 simulations with over 10 variables each, the best scenario would deliver a 13-block green wave for cyclists and a 19-block green wave for pedestrians without delay for car traffic, which would be proceeding at 25 mph. In this scenario, out of 70 seconds of green light on the avenue, Split Lead Bicyclist Intervals (Split LBIs) would provide 30 seconds of full protection for cyclists and pedestrians, and then 40 seconds of semi protection with a yellow blinking arrow. This duration could be adjusted case by case based on the volume of turning cars. The DOT study was in response to bicyclists’ complaints that the mixing zones are difficult to negotiate and feel unsafe. Pedestrians had long complained as well that those intersections were dangerous. 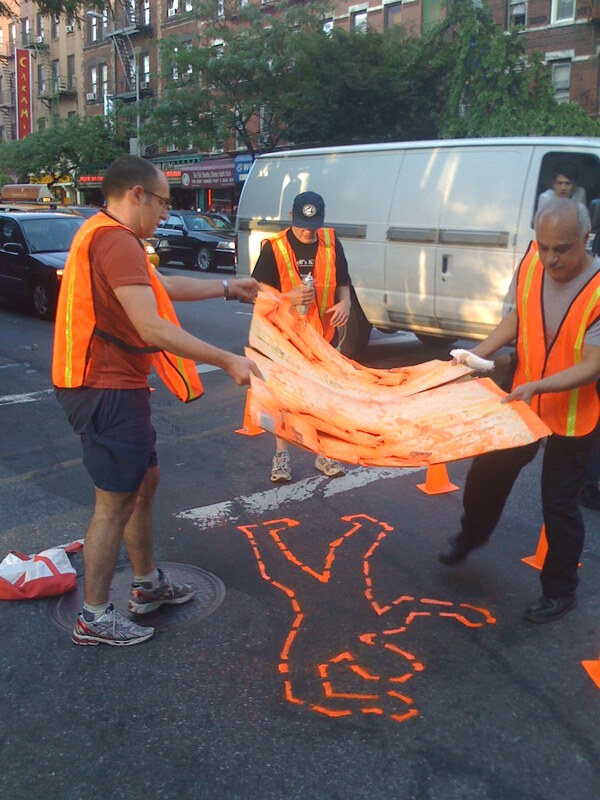 In 2013, DOT published statistics showing that about 25 % of pedestrian fatalities or injuries occurred at intersections with a left turn movement. 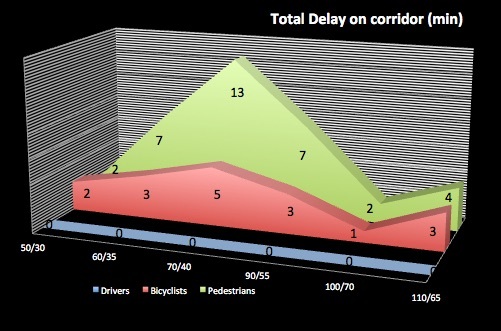 The study concludes that the “Delayed Turn” (aka Split LBI) – one of the two pilot designs that show promises – provided for the lowest rate of conflict between turning vehicles and bicycles. The signal provides a conflict free head start for bicyclists before turning drivers are given a blinking yellow arrow to proceed with caution. Similar treatments called Split Lead Pedestrian Intervals (Split LPI) are already installed at various pedestrian crossings in the City. However the conflicts remains – albeit at a much-reduced rate. Cyclists had been resistant to pedestrian advocates’ call to install Fully Split Phases that provide 100% protection from turning cars. This treatment causes cyclists to stop at every other traffic light making their trip cumbersome, or at worst giving them an incentive to run red lights. 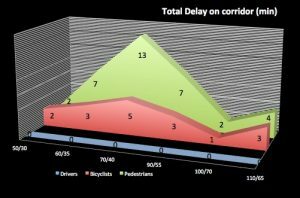 As part of its reports’ recommendations DOT plans to develop strategies to improve signal coordination that reduces bicyclist stopping and delay along corridors with several Fully Split Phase intersections. How does it work? The simulation we developed is novel for several reasons. The goal was to identify what light cycle length would allow drivers, bicyclists and pedestrians to arrive at the intersection during the green phase as often as possible. As far as we know, no traffic engineering has taken advantage of the alternate timed speeds, which are possible when traffic signals are timed. Conceptually, think of this as hitting one block near the start of the green cycle, the next near the end of the green cycle, and so forth. To illustrate this concept, consider how traffic signals are timed in the first place. In general, traffic engineers stagger the light cycles so if you travel at a predetermined speed, you will always reach each intersection at the same point in the light cycle. For our simulation, where we assumed 20 blocks to a mile, and a timed speed of 25 mph, the signals had to be staggered by 7.2 seconds, as this is how long it takes to travel one block at 25 mph. Now consider that a person who takes 7.2 seconds plus one light cycle will also arrive at each block at the same point in the light cycle. Interestingly, this isn’t the only possibility mathematically. You can take 7.2 seconds, plus any number of light cycles, and find yourself in a green wave. And if the green cycle is longer than half the total cycle time, then 7.2 seconds plus ½ the total cycle time to go a block can work. So can taking 1.5 times the total cycle time to travel one block, and so forth. The only downside here is for closely spaced signals alternate green waves only exist for pedestrian speeds, not cyclist speeds. However, this doesn’t preclude finding light timings which are much more advantageous for cyclists than current light timings. This represents a zero-cost method of speeding up cycling on streets where it’s possible to time traffic signals in the first place. The one-way Manhattan Avenues represent one of the best opportunities for this novel approach. The simulation is also notable for the fact that we accounted for cyclist acceleration. This makes the simulation much more realistic, as we all know that it takes some time to get going again after a stop. Fortunately, others have done research of typical cyclist acceleration rates so that we didn’t have to just guess. For the purposes of this simulation we assumed an acceleration rate of 1 mph/sec up to 15 mph, and 0.5 mph/sec thereafter. We also assumed a cruising speed of 15 mph. This might be a little on the high side, but the percentage delay is similar for lower speeds at the most optimal timing. 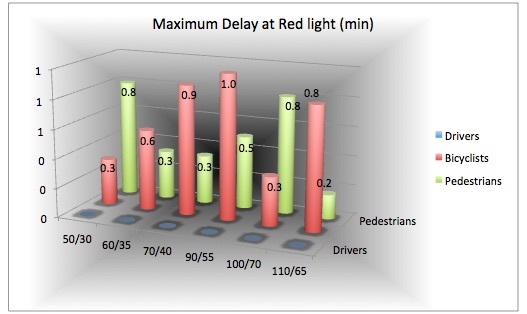 Also worth noting is that percentage delay will decrease at speeds over 15 mph. Therefore, faster cyclists aren’t negatively impacted by optimizations which benefit a range of slower cyclist speeds.While of course removing as many traffic signals as possible is the best way to optimize things for pedestrians and cyclists, unfortunately this approach will not be feasible in places like Manhattan without first dramatically reducing motor traffic. Therefore, optimizing signal timing as well as it can possibly be optimized for all street users, not just motorists, represents the best way forward at present. Joseph Realmuto is a graduate of Princeton University (major electrical engineering) and Bronx High School of Science. He took a course in transportation engineering and planning while at Princeton, and has pursued an interest in all facets of transportation. In the last ten years he has developed a keen interest in the livable streets movement. Christine Berthet graduated from HEC France with an MBA in Operational Research and worked for IBM as a systems engineer. In 2005, she co-founded Chekpeds, a pedestrian advocacy group that developed Crashmapper.org, a web-based application to analyze traffic fatalities and injuries. 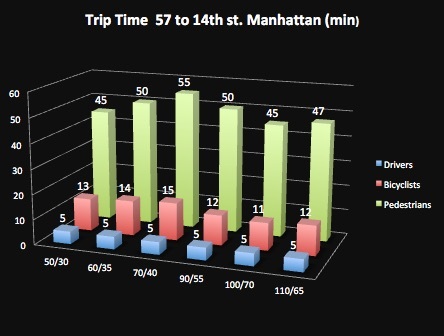 In a letter responding to a request from Manhattan Community Board 4, Polly Trottenberg, Commissioner of NYC Department of Transportation indicated this week that a study is underway for the 8th Avenue corridor , from 35th to 47th Street. DOT, jointly with the Port Authority of New York and New Jersey, will attempt to resolve the dangerous conditions for both pedestrians and bicyclists on that stretch. The study should be completed in 2019. We are delighted. injuries per month being the norm. One of our neighbors was injured in a conflict with a pedestrian on the same stretch. Streets films and Mark Gorton illustrated the situation earlier this year. CBS replicated the segment. This a very encouraging outcome, although injuries should not be a prerequisite to fixing a corridor we have been complaining about for years. Yesterday Governor Cuomo signed an executive “emergency order” to allow the city of New York to reactivate the 140 existing speed cameras which had been shut down in July, and work with the DMV to implement this change. Tomorrow the City Council will vote on a bill to reinstate the cameras and Mayor di Blasio will sign a ” Bill of Necessity” the city equivalent of the emergency order. Cuomo said, “the cameras have reduced crashes by 60% where installed . By not renewing the program we run the real risk of causing children’s deaths”. He also credited Speaker Johnson for working closely with both the Governor and the mayor to think outside the box and achieve this result. This is a stunning outcome for a situation that had turned desperate during the summer, with the Republican-led senate refusing to return to Albany to pass the bill . Families for Safe Streets and Transportation Alternatives advocates staged numerous demonstrations including running a marathon around Senator Marty Golden’s block. The bill introduced in the council could allow more cameras in the future. This is an outstanding outcome to a very long fight. Both Families for Safe Streets and Transporation Alternatives deserve an enormous credit as well as Speaker Johnson. Senator Flanagan and Golden who stubbornly blocked the bill for political reasons, do not deserve to represent their districts. Tuesday, September 4th, 6 – 7:30 p.m. These appliances which look like a children ‘s toy have showed up in various cities and caused consternation with pedestrians as described in this article “What ends up on the Sidewalk“. Create parking for these vehicles in the Parking lane . Let the operators fund and maintain these parking spaces. Allow only scooters designed for a maximum speed of 10 mph. 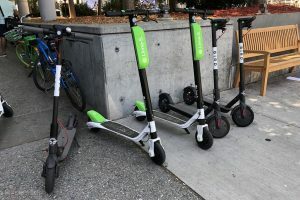 Increase enforcement of illegal use of all vehicles including scooters; in particular riding or parking on sidewalk and going the wrong way should get increased penalties. Convene a task force to study sidewalk encroachments and resolve the multi-agency conflicts as well as propose sidewalk enlargement. We look forward to hearing your comments below..
Corey Johnson sent a letter to DOT asking for better pedestrian protection on the proposed 10th Avenue bike lane . DOT has agreed to change the traffic signals on 10th Avenue to comply with the 25mph during the day and night. MTA published their action plan in may and has already implanted route changes in Staten Island. 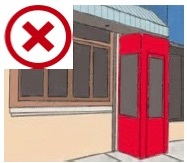 Fuji jitneys has lost its permit for the bus stops located at 327 West 42nd Street and 301 WEst 40th street. 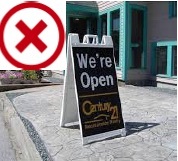 DOT followed CB4 recommendations that their permit be terminated. A very good news for the community. Dock-less Citibike debuted in the Bronx – Their biggest proponent? Mayor De Blasio who does not want to sacrifice even One parking space! A tourist was killed on the Central Park West bike lane . Tragic but not surprising: the ” bike lane ” is only a line painted on the ground. A waste of paint if you ask me . At least it will prompt DOT in doing the right thing and put a protected bike lane around the park. 26th and 29th street protected crosstown bike lanes are near completion . New York State DOT is working on a traffic study for the Greenway and the West Side Highway initiated by a CHEKPEDS’ letter to Senator Brad Hoylman last year. A meeting was organized by the Senator’s office with NYS DOT to review the progress to date with the affected community boards. Nothing tangible yet. New York city announced new parking rates to encourage more turn over. As a result the cost of placards to the rest of the citizens will reach $ 1.5 billion a year. Who will have the balls to tackle this baby? It was a very busy summer indeed.